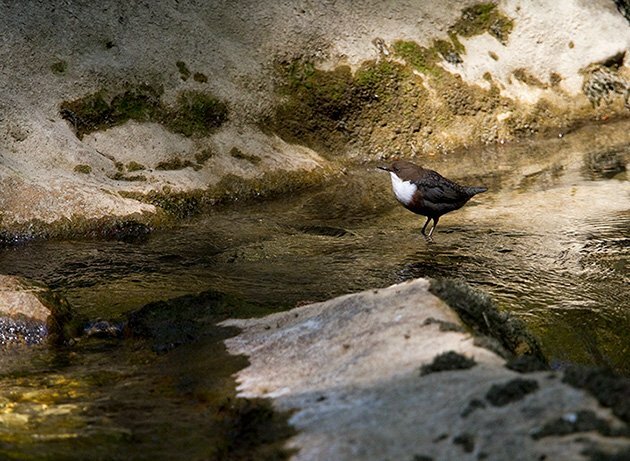 I encountered a pair of White-throated Dippers (Cinclus cinclus) during my trip to Switzerland last summer. 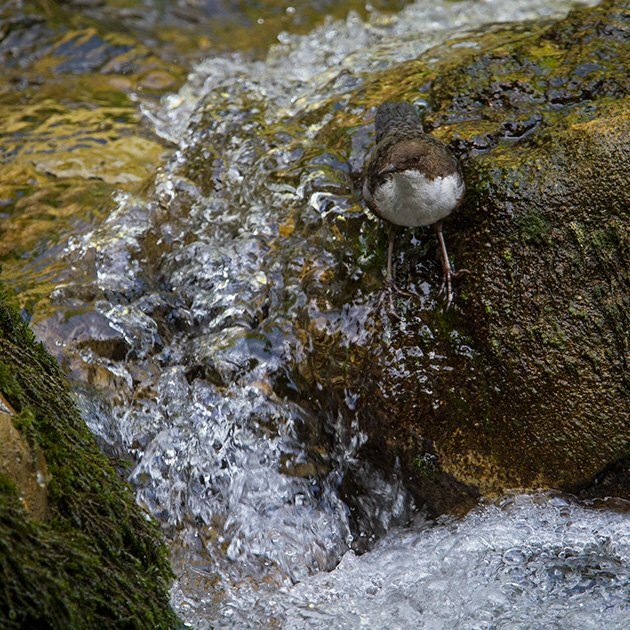 Their habitat is fast-running, rocky streams and rivers where they feed on aquatic invertebrates and insects, larvae, mollusks and small fish. I know just that kind of place near my hometown in northwest Switzerland, a gorge that cuts through the southernmost range of the Jura Mountains. As one of the few natural crossings from the Swiss Plateau to the Rhine, it has been extensively traveled since the Roman Empire and earlier. 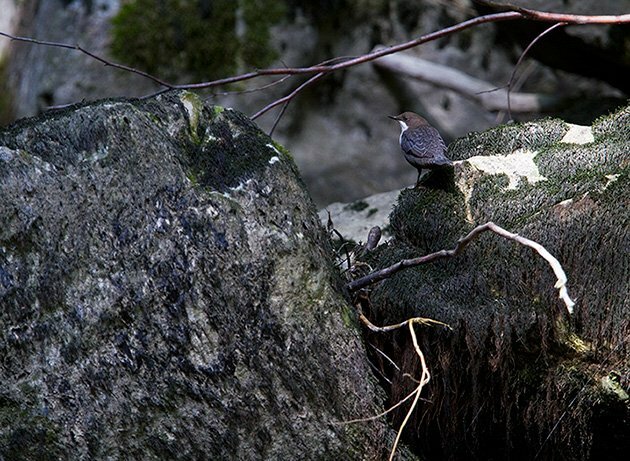 White-throated Dippers nest by the water, usually in a crack or hollow in the rock or bridge support. 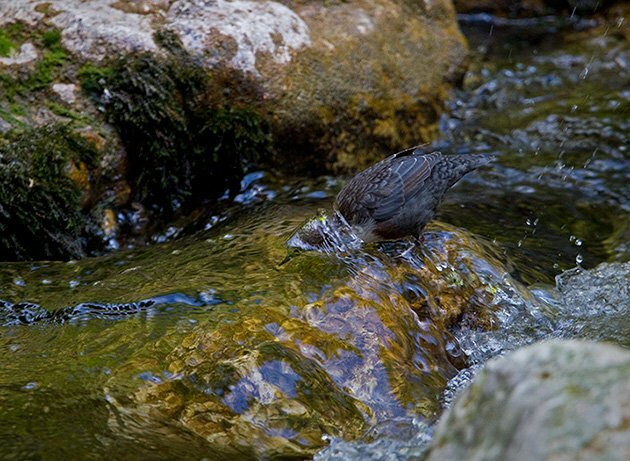 They have their own unique hunting technique – they”dip” their heads in the water and walk on the bottom of streams, using their tail and wings to get downward pressure and even “swim” underwater. Their aquatic adaptations include dense plumage and a membrane that seals the bird’s nostrils during dives like the one above. They are great birds and fun to watch and photograph. How did I take these pictures? The lighting situation is tricky down at the bottom of a canyon. Direct sunlight is spotty and harsh, shining through tree foliage and open spots. Of course, a speedlite can help fill the shadows, but I always prefer natural light first. Therefore timing is key, when the sun hits the sheer vertical cliffs (the side without trees) and serves as a giant reflector. This will provide enough soft light for images at decent shutter speed. These pictures shot with a 300mm prime lens and 1.4x extender at f 4 and a shutter speed between 1/400 and 1/2000, using a monopod support. 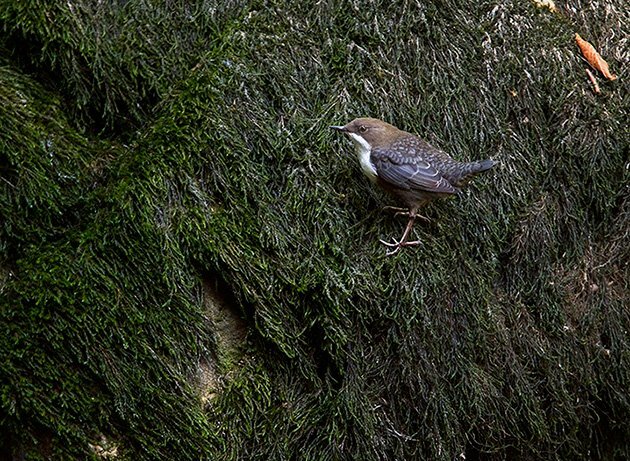 We’re sure you liked these shots of White-throated Dippers. If you want to see more great images of birds check out our big and growing page of photo galleries, 10,000 Clicks! 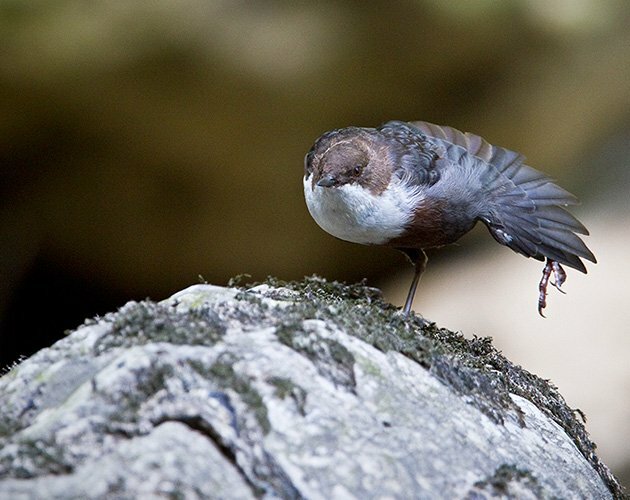 What a lovely dipper! 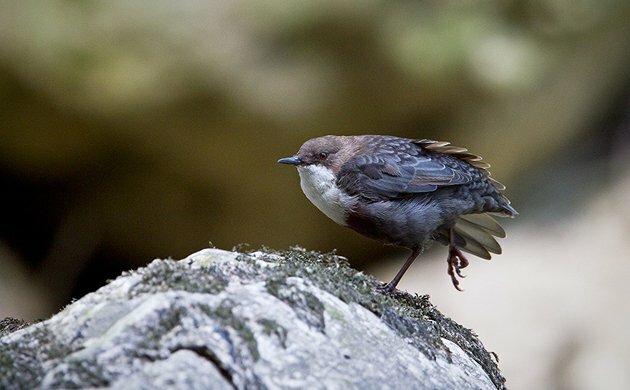 I’ve only seen the American dipper, but I hope to add more of these amazingly unique birds to my life list one day. Thanks for the inspiration! Great photos! 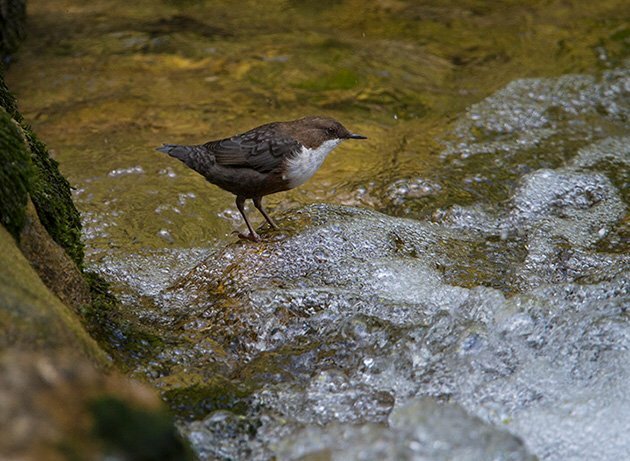 I just watched an outdoor nature show on German TV that featured White-throated Dipper. Now that I live in Germany, I hope to find one during a birding foray in the mountains. I would def like to see more of what Francois can do with his lens! 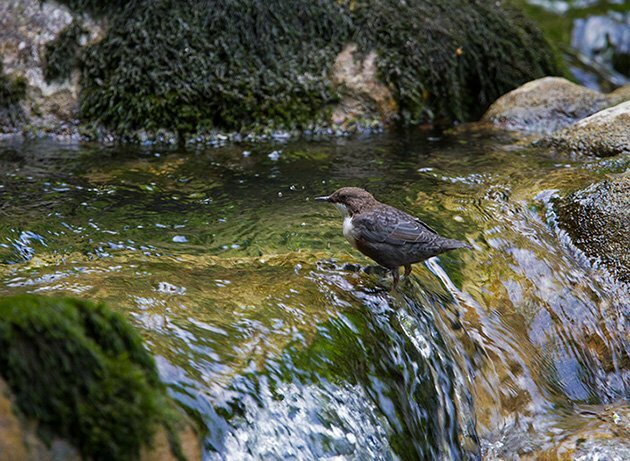 These are fantastic photos, and seeing them is even better than the one time I saw an American Dipper in a creek in Oregon. Thank you!